One of our favorite aspects of Grand Marais, Minnesota, is the strong artist vibe everywhere you look. Even though the town is home to only around 1,300 inhabitants, it is filled with endless creativity. Grand Marais is home to a variety of public art, galleries, adorable shops, artist studios, art festivals, creative restaurants, breweries, and a wide range of classes in everything from making cheese, to knitting, to building a boat. Every time we visit, we have to explore some of the local art scene, and this time around was no exception. 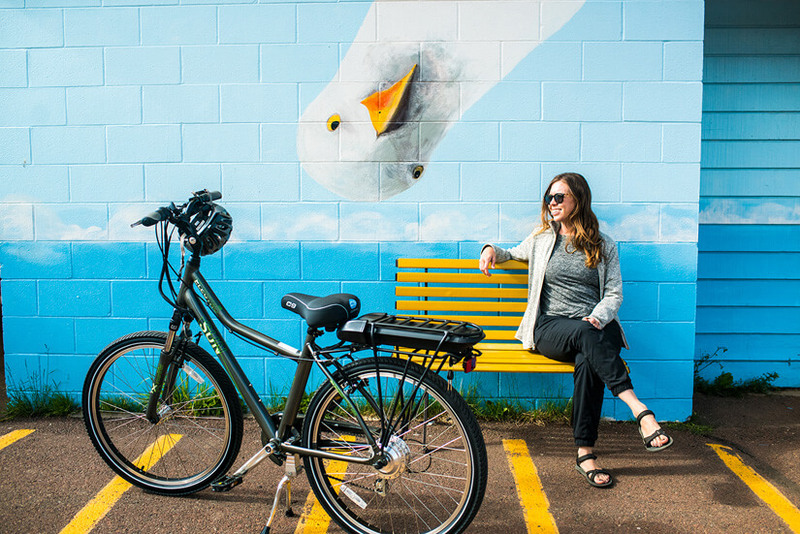 We rented electric bikes from Fireweed Bike Cooperative and zoomed around town to a wide variety of artsy sites–the art in Grand Marais is fantastic to say the least! First of all, can we talk about the e-bikes for a second? We never knew how fun they are to ride—we literally flew through the streets of Grand Marais all while laughing like maniacs. When we arrived at Fireweed Bike Cooperative to pick up our bikes, we were hooked up with two brand new electric bikes fresh out of the box. They had just finished charging, so we were the first guinea pigs to give them a try. We were given a briefing on how to ride our crazy bikes and after popping on a helmet, we were on our way. All we had to do was start peddling and then twist the handle, and just like that, we were zooming down the streets. The first half of our art adventure was to check out the public art around town. We rode our bikes to murals, sculptures, and stores to find a unique variety of art. First up was a stop at the Beaver House, which is primarily a bait and tackle store. It is one of the most iconic buildings in Grand Marais. There are murals painted all over the outside of the shop, and on top, there is a giant fish sculpture that looks as though it is diving right through the roof of the building! Even the public restrooms have art in Grand Marais. We loved the seagull mural—the bright yellow and blue really pop. Como Oil has a fun fish mural on a giant oil tank. And, the mosaic at Johnson’s Foods grocery store runs almost the entire length of the building. The Grand Marais Library has some public art in the form of a sculpture. There is a large, colorful puzzle piece sculpture in the front lawn. Along the shore of Lake Superior, you can find a sculpture/statue of a bear climbing high on a pole at Bear Tree Park. Look close at the wall above Joynes Ben Franklin because hiding high in the sky is a cute little chickadee! Located in the alley on the Birch Bark Books building, there is a mural of different scenes from the Grand Marais area. For more murals, head to the two garages near the Cook County Whole Foods Co-Op. The garage doors are painted with fun designs and the rustic buildings have a ton of character. Then, the next morning it was time to check out the galleries, shops, and artist studios located around town. Our first stop of the day was Sivertson Gallery, which is a gallery that exhibits the work of over 60 artists in the region, as well as native art from the Canadian Inuit, Alaskan Native, Canadian First Nation, and Native American. It’s home to a fun mix of paintings, sculptures, cards, jewelry, decorations and much more. The Big Lake was one of my favorite shops of the day. It is a family run business that focuses on selling items that reflect the allure, beauty and culture of Lake Superior’s North Shore. Inside, you can find a variety of jewelry, crafts, books, ceramics, candles, and wall art. When we walked inside Joy & Co., I wasn’t sure what was in front of me. It was a fascinating mix of art supplies, artwork, antique & vintage items, locally crafted jewelry, and even a room full of records that you could sample before committing to a purchase! We loved wandering around the different sections of the giant store and exploring the wide range of unique items throughout. Upstate is another fun shop located right downtown Grand Marais; they aim to share the stories of artists and makers, while supporting them in their work. The storefront is filled with contemporary, artistic items that can be used in your everyday life, such as home and kitchen items, stationery, accessories, and apothecary. Yellow Bird Fine Arts features works from a variety of different accomplished and inventive artists. The gallery is on the smaller side, but we really enjoyed browsing the paintings, sculptures, and jewelry. The Betsy Bowen Art Studio is a printmaking operation located in a historic church. Inside you can peek into the actual artist studio workspace, as well as explore the beautiful art throughout the gallery. 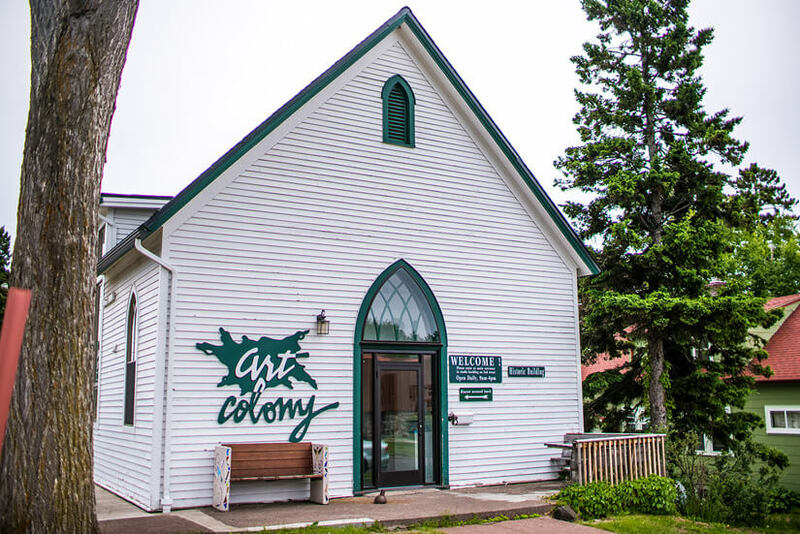 The Grand Marais Art Colony exists to support the need for creative expression of artists and creatives. The community here is welcoming, nurturing, and encouraging, and they offer a variety of classes and art education. Inside the store you can find art from local artists, studio artists, and Art Colony instructors. The mission of the North House Folk School is to build community and enrich lives by teaching traditional northern crafts. You can sign up for a variety of courses, events, and programs here, such as woodcarving, artisan bread immersion, boatbuilding, and daily sailing excursions (which we did later in the week!). The courses are very specific and in depth (think antler basketry or celestial navigation), so if you are looking to try your hand at a new skill, this is the place to give it a go! They also have a shop filled with handmade items, books, clothing, and more. Digging into the artistic culture and art in Grand Marais is always a wonderful time and doing it by e-bike was even better. We’d definitely recommend trying out an electric bike if you have the chance—they were just so much fun! 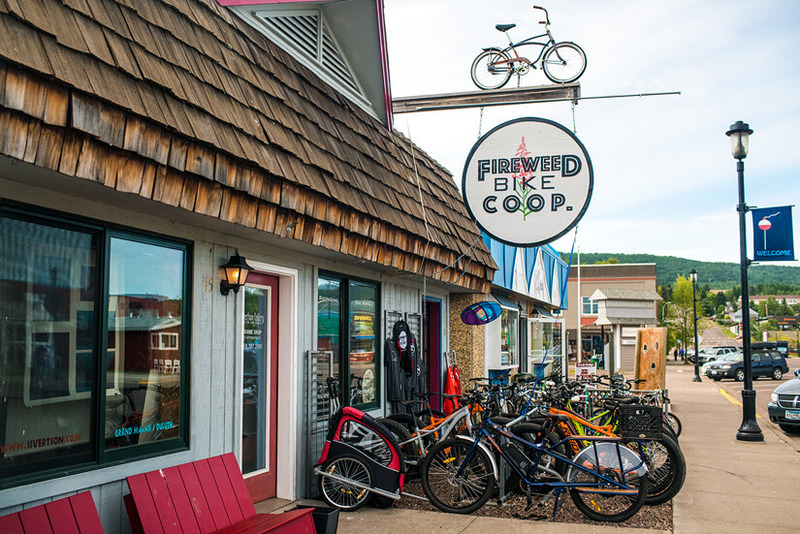 But, Fireweed Bike Co-op also offers a wide variety of other bike options to rent and/or buy, so you could opt for a regular bike or even a tandem bike instead! We visited Cook County, as part of a paid content creation project. Special thanks to Visit Cook County and Fireweed Bike Cooperative for hosting us on this adventure. As always, all opinions are our own.